President Barack Obama meets with U.S. 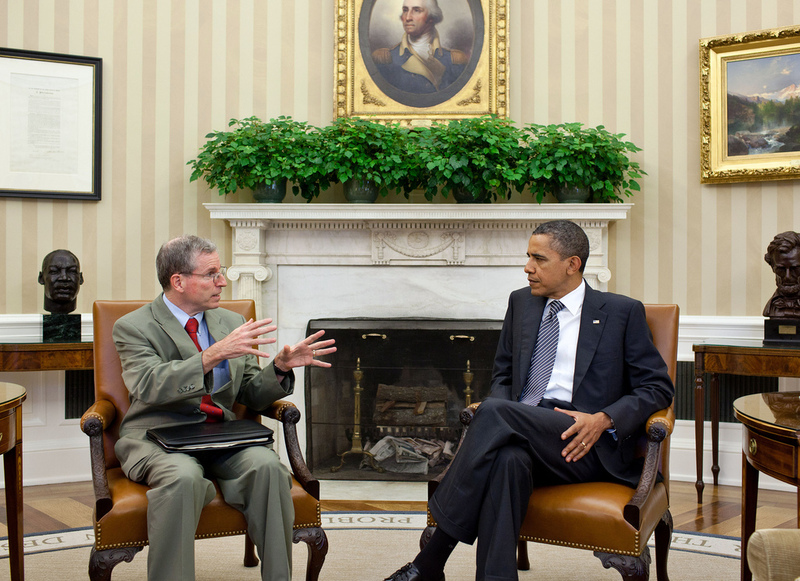 Ambassador to Syria Robert Ford in the Oval Office, Aug. 1, 2011. White House Photo by Pete Souza. Don’t worry. The red line hasn’t been tripped yet. At least President Obama said as much during a press conference last week about the worsening situation in Syria. You may have missed it, but by indicating that a red line would be crossed by the Syrian government’s hostile movement, use, or loss of control of Weapons of Mass Destruction (WMD, including various nerve gasses), President Obama implied that there actually exists some kind of red line that, if the Assad regime crosses, would merit foreign intervention. It was also implied that the regime’s massacres to date — which the UN estimates have killed 23,000 civilians since the conflict began — have not crossed this line. Strangely, it was also implied that the massacring Assad government is, at least at present, sufficiently trustworthy, capable, and deterable to control its WMD even while it is conducting a political cleansing campaign. A lot of attention is given to the instrument of WMD, sometimes to the apparent neglect of the ultimate outcome — ‘MD’, or mass destruction — that we’re all so concerned about. Is there a red line for atrocities? In Iraq, Saddam Hussein apparently used WMD against civilians during Kurdish uprisings in the late-1980s, yet we didn’t lift a finger. On the other hand when the US did intervene in 2003, Saddam had persecuted and killed many civilians, but with no WMDs in sight. What if all Syrians were targeted, but without the use of WMD? Would that entail a red line? Is it that mass killing without WMD is relatively predictable and tolerable since it is more likely to stay within the confines of a target state’s borders, while the uses of WMD are less predictable, more prone to international spillovers, and thus more terrorizing? This begs an uncomfortable question: if countries are not simply willing to act out of moral principles (including those that have ratified the Genocide Convention), then what’s the moral calculus, if there is one? How many civilians must be killed, at what rate, with what certainty, or with what potential for spillovers to merit international action? Something tells me the red line is not going to be victim number 23,001 unless that person is killed with WMD. Humanitarian interventions are by no means simple pursuits given international collective action problems and the risks from changing conditions on the ground. With Syria, there is rightly great caution about possible negative reactions. For instance, Erica Chenoweth’s recent post referenced research showing that some kinds of interventions may accelerate the pace of human rights abuses. We may not know whether interventions possibly decrease the number of violations on net and yield fewer actual civilian casualties if we only consider the possible shifts that interventions induce — toward either greater ruthless and audacity or toward restraint — in the strategies of target states (which human rights indices seem to mainly reflect). We must also consider the other side of the equation of the possible protective effects that various kinds of interventions may have. There can also be unintended consequences from letting events play out as well, with the potentially destabilizing effects of Syrian refugee crises in neighboring countries being just one example. Do the risks of intervention imply that we never do anything, no matter how bad atrocities become? If anything is clear from Obama’s comments, it’s that the battle of the red lines may be just beginning. You have a fairly strong assumption that intervention will end the killing, even though in Iraq all the killing came after the intervention, continuing throughout the intervention and on after the withdrawal (albeit at varying rates, to be sure). Moreover, the killing that resulted was not a consequence of any strategy on the part of the target state–the target state having ceased to be a factor almost as soon as the intervention began–but rather of rival factions seeking to replace the former government. Is there reason to believe that something similar would not happen in Syria? This is an excellent point and thank you for the comment. I do not make the assumption that any particular kind of intervention will put a stop to the killing. 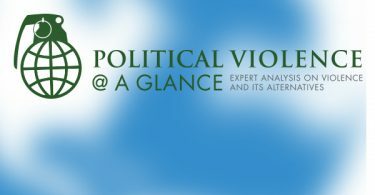 Rather I believe it is important to consider what kinds of interventions might be productive and for society to consider how much violence it is willing to tolerate against civilians relative to the broader risks of intervention. In the case of Iraq, I think one would have to ask the question of whether, given political constraints, a better-planned and more effective intervention could have been implemented (conditional on making the choice to intervene) that would have led to less bloodshed. Scott, I think that is a good point. Any follow up to a someone arguing for intervention should be: What kind of intervention? A US only or US directed intervention could turn out like Iraq, but what about a NATO or Turkish-led intervention? There will not be a Turkish-led intervention. Turkey does not have the financial or military resources right now to take up such a burden. Nor do Turkish people care enough about atrocities in Syria to support an intervention that might cost the lives of hundreds, and maybe thousands, of Turkish soldiers. Moreover, Asad-loyalists will not be the only ones to resist a TR-led intervention. If Turkey intervened in Syria, it would have to enter the country from the north, where the Kurdish groups are right now carving out their territory while the rest of Syria is fighting in the south. Kurds will not let Turkey into Syria to stamp out the chaos that is allowing Kurds the freedom to become autonomous. Will the Turkish government intervene despite all these factors? The AKP government’s strength comes from its ability to deliver economic and political stability. It is already weakened by the re-ignited PKK rebellion inside Turkey. The last thing it needs is to start fighting a war in Syria. Joseph, thanks for taking up the conversation. Making the intervention multilateral would increase its legitimacy in the eyes of the international community, but wouldn’t it still be “a bunch of outsiders” to the local factions (some of whom would ally with it to seek advantage over rival factions)? The presence of NATO in Afghanistan hasn’t really soothed matters there. A more relevant factor might be the timing of an intervention, that is to say, at what stage in the evolution of a conflict does it come? Or perhaps the manner in which the old regime is removed. I didn’t see Kerokan’s response before. I think he also makes valid points. We sometimes see local powers as more appropriate surrogates for intervention, but neighboring states frequently have a history of hostility or rivalry that makes them far from neutral in the eyes of the target state’s population. This has certainly been a problem with Ethiopia in Somalia.